Prothane TOTAL KITS contain the most popular components for the listed vehicle BUT not necessarily everything that is available. Now you can take advantage of our matched components that will not only totally improve your ride but everything will work together for a maximum improvement. Enjoy the most out of your vehicle by upgrading most of your major suspension components with a Prothane TOTAL KIT. TOTAL KITS are available in either red or black. The ball joint�s smoothness of operation and service life are very much affected by dirt, moisture, and other contaminant�s. For this reason, PROTHANE ball joint boots are essential for protecting this important suspension component. Take your pick of black, or red colored boots. 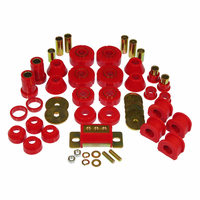 One of the most cost-effective methods of improving the handling and �feel� of any vehicle is to replace the mushy and probably worn-out OEM rubber body mount bushings. PROTHANE body and cab mounts provide the necessary rigidity, yet have ample resilience to keep every thing quiet. Perfect for both off-road and street use. You can imagine how difficult it is to maintain the proper front suspension caster and camber when the control arms are wobbling on mushy rubber bushings. PROTHANE�S design provides superior handling through optimum compliance resistance. Furthermore, you can be assured that your alignment settings will be accurately maintained. A vital addition to any vehicle. Controls unwanted hop or shudder. PROTHANE offers complete kits for all popular rear two and four arm applications. We offer a selection of both shelled and unshelled versions. Helping to keep the driveline properly aligned is an important benefit of PROTHANE polyurethane bushings. 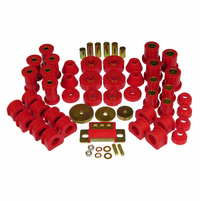 Factory bushings tend to wear out, with the resultant sloppiness putting the driveline in a potential �bind� condition. Controlling horsepower benefits acceleration and handling. One of the sloppiest items on front drive cars can be the shifter. This is especially true if the car is getting older or has been shifted hard. 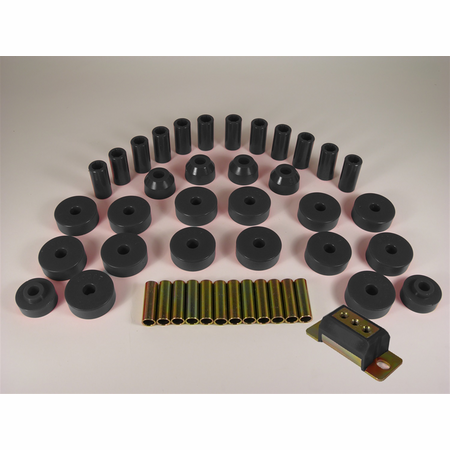 Our bushings firm up your linkage while providing you with added confidence during power shifts. A very inexpensive performance enhancer! Upgrade your new shock absorbers or breathe new life into your old ones with these PROTHANE shock mounts, eyes & grommets. Models to fit most GM applications and most Mustangs. Solves the common problem of worn or rotted OEM rubber pads. Reduces noise and looks great! Check the vehicle listings section for specific applications. In leaf spring-type suspensions there are significant forces focused on the pivot points and shackles. For this reason, it is imperative to replace the soft, blown-out OEM rubber bushings with PROTHANE premium grade polyurethane components. All related sleeves, etc.. are precision fabricated to assure a perfect fit. PROTHANE offers high performance steering components that will last longer and improve chassis feedback. From rack & pinion to worm gear boxes, we have a variety of applications. While most models are direct factory replacements, we also offer various rack & pinion �offset� versions for those with modified ride height. Rapid acceleration and hard braking place varying loads on the suspension, and in some applications strut rods are employed to maintain proper alignment. 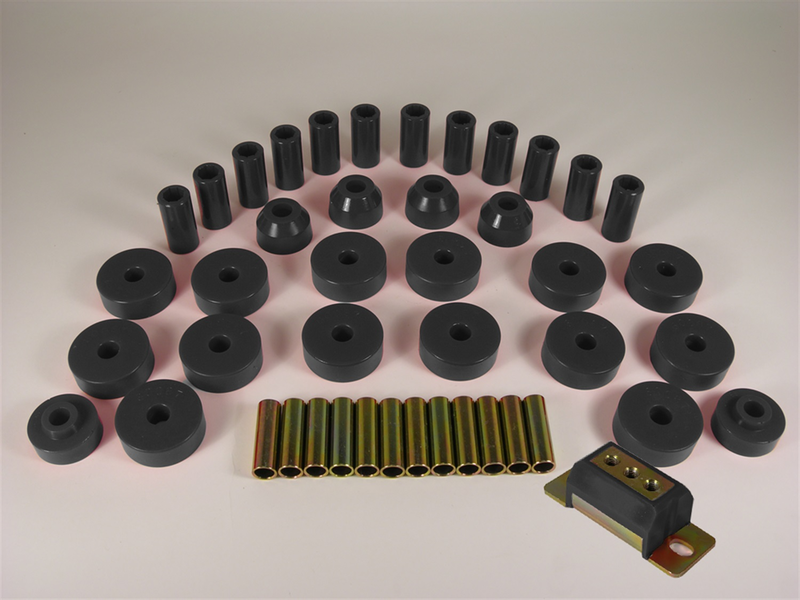 PROTHANE�S durable, responsive polyurethane bushings are far superior to the OEM rubber components or parts, which typically have deteriorated. 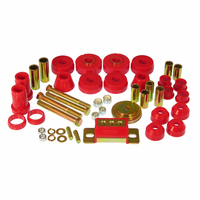 The effectiveness of OEM stabilizer (anti-roll or sway) bars can easily be enhanced through replacing the mushy stock rubber bushings with firm PROTHANE polyurethane bushings. They feature grooved bores, designed to hold PROTHANE�S Super Grease,for quiet operation. Also available for larger diameter high performance sway bars. Protect Tie Rod End Joints from dirt, sand, water and snow. Retains lubrication better than rubber because Hi-Tech Urethane will not deteriorate from grease. Factory rubber mounts were never intended to take much abuse, so the resultant sloppiness in your drivetrain can be largely traced to the Transmission Mounts. Our mounts are designed to control torque and eliminate breakage. Where applicable, our mounts feature our Poly-Locked �run-safe� interlocking device so you�ll never be left stranded like a broken stock mount will.